In what has been a rather confusing few days, and they’ve all centered on the mid-size Mercedes pickup that will go to market before 2020. Dr. Dieter Zetsche, the big man in charge at Mercedes, had said that it’d be ideal in markets like South Africa, Latin America, Australia, and more, but the USA was never mentioned for the possibly Nissan-based trucklet. Apparently it should have been. A report from Automotive News states that Mercedes will decide by the end of the year if it is going to sell the mid-sized luxo-hauler in the states or not. They also say that if it comes to America, it won’t be as a commercial vehicle, but as a luxury passenger pickup. MBUSA CEO Steve Cannon said that if you go around Greenwich, CT, you see a ton of pickups, and not all of them are being used to get to job sites. You might think that means that Mercedes wants to pick up (that’s not a pun, I swear) where the Lincoln Mark LT and Cadillac Escalade EXT left off, but you’d be wrong. Pickups have gone so far upmarket in recent years, that a Mercedes proposition actually makes a good amount of sense. Imagine something the size of a Chevy Colorado that’s priced closer to a top range F-150. Luxury with utility. Can’t wait for the AMG version. Unfortunately, Ram isn’t going to compete head to head with the Colorado and Canyon. Automotive News (who really seem to be ace at the pickup beat from NY) caught up with Ram boss Bob Hegbloom, who said that Ram just can’t make the numbers work for a new Dakota-esque pickup. The main problem is finding a way to make these an economy proposition, with amazing fuel economy being the issue. If the Ram 1500 EcoDiesel can hit 29 MPG, then the buyer of a smaller pickup wants something that can do considerably better. And with the best ratings that the Colorado and Canyon can get hovering around 27 MPG, they just don’t have the solution now. Tesla enjoys hefty rebates in California thanks to their zero-emission status. But most Tesla’s are bought by people who make twice the national average, and it seems that’s not playing well at all. Bloomberg says that a lot of people in California are having a tough time with understanding why people that make so much money deserve a rebate on a car that costs somewhere in the neighborhood of $100,000. California isn’t close to the only state to offer a rebate, but they do offer $2,500 on electric cars in addition to the $7,500 federal tax credit. That’s a hell of a deal and it’s part of the reason why California is Tesla’s biggest market. State Senator Ted Gaines is proposing that the rebates be eliminated on cars that cost more than $40,000 with an increased rebate of $3,500. That’s all well and good, but any electric car that costs that much won’t have the range of the Model S, it’ll more than likely be a compliance car. So far, the legislation hasn’t taken hold, let’s see what happens. Everything needs to be connected these days, apparently. That’s why Chinese automaker SAIC and internet giant Alibaba are partnering on a car that will be released in August 2016. Alibaba has made a $160 million investment to make the car happen, but all we have right now are some loose terms like “GPS mapping” and “financial data” and “digital entertainment.” They better do better than that, because right now it sounds like a rather normal car. Originally I thought this was a probe into the Ford Lightning, and I was concerned that my favorite short bed hot rod pickup was under fire. But thankfully, no, no it isn’t. Actually, NHTSA has begun considering an official investigation into lighting issues on 518,000 Crown Vics and Grand Marquis. Apparently, the lights might fail or break, which is bad. Ford has extended the warranty on these cars for repairs if something does go wrong. No word on a recall yet. Emil Jellinek, an entrepreneur who commissioned engineer Wilhelm Maybach to design the first Mercedes automobile, named after Jellinek’s daughter, is born in Leipzig, Germany, on this day in 1853. 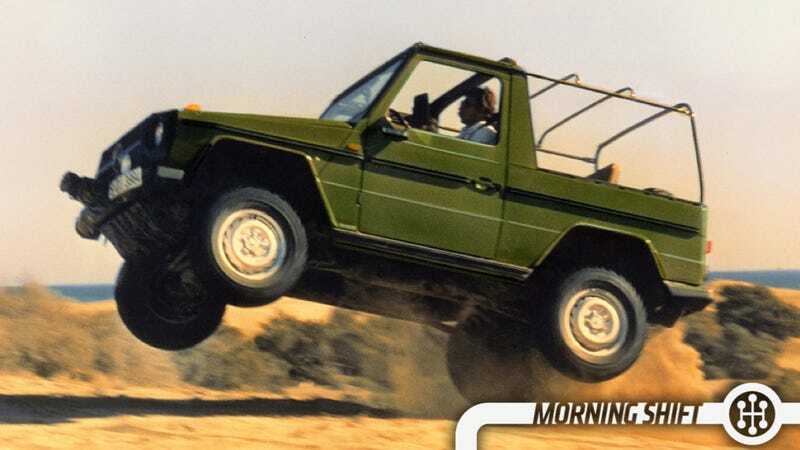 Should Mercedes sell this pickup in the US? Or will they have another Lincoln Blackwood on their hands?